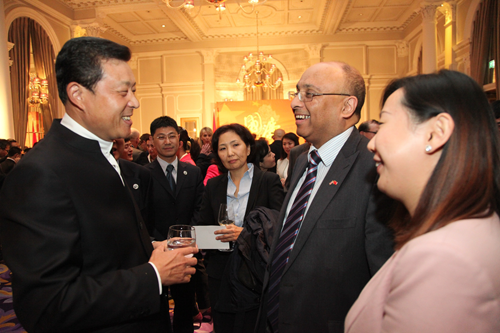 On the evening of 22 September 2015, Chinese and foreign guests gathered at the brightly-lit banquet hall of Corinthia Hotel London by the River Thames, where a reception was hosted by Ambassador Liu Xiaoming and Madame Hu Pinghua to mark the 66th anniversary of the founding of the People's Republic of China. Presided over by Minister Ni Jian, the reception was attended by over 600 guests from all walks of life, including British Cabinet Minister Oliver Letwin, Vice Chief of the Defence Staff and Air Chief Marshal Sir Stuart Peach, former Deputy Prime Minister Lord Heseltine, Vice Chair Mark Hendrick of the All Party Parliamentary China Group, foreign envoys in the UK, overseas Chinese, Chinese students studying in the UK and representatives from China-funded institutions in the UK. Ambassador Liu delivered a warm speech. Beginning with the old Chinese blessing, 'double six bring success', which was believed to have originated from the ancient tome called The Book of Change, also known as I Ching, the Ambassador went on to cite two frequently-quoted lines that are related to this blessing: "As heaven maintains vigour through movements, a gentleman should constantly strive for self-perfection; As earth's condition is receptive devotion, a gentleman should hold the outer world with broad mind." The past year proved how relevant these lines were as China rose up to challenges, overcame difficulties, achieved great success and adhered steadfastly to the path of peaceful development while at the same time strived to foster a community of development and shared interests with countries of the world for win-win, inclusive and common progress. Ambassador Liu listed out some of the highlights of the past year, including the successful 22nd APEC Economic Leaders Meeting; the launch of the Asia Infrastructure Investment Bank which brought together 57 countries in and outside the region; the grand commemoration the 70th anniversary of the victory of the Chinese People's War against Japanese Aggression and the World Anti-Fascist War; the successful bid for the 2022 Winter Olympics; and the excellent 2015 World Athletics Championship. 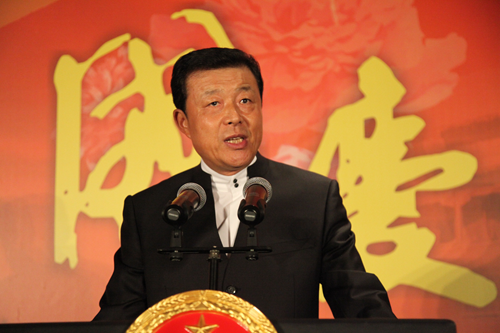 He briefed the guests on the four-pronged, comprehensive blueprint for China's future development, i.e. building moderate prosperity in all respects, deepening reforms in an all round way, advancing rule of law in every aspect, and strengthening all-round Party discipline. The Ambassador also noted that China moved ahead with the initiative of 'One Belt, One Road', saying that this would offer huge opportunities for the world to share as well as bring China into global cooperation on production capacity. Like many other countries in the world, China had to deal with the lacklustre global recovery and world economic slowdown. At home, China was adapting to and working along with the economic new normal; taking targeted, discretionary and precise measures of creative macro regulation; introducing new reforms into the economy where greater dynamism was needed; and constantly pushing for mass entrepreneurship and innovation. In the new normal, the ups and downs in the economy may have formed the shape of a curving wave, but the underlying trend remained to be positive. Despite the moderation in speed, the Chinese economy has been stable, maintaining in a positive trend and continuing to make progress. Commenting on the good momentum of China-UK relations, Ambassador Liu noted that 2015 has been a 'golden year' in terms of unprecedented high-level visits and dialogues, striking economic and financial achievements and flourishing cultural and people-to-people exchanges. He listed out the major achievements of the exchanges and cooperation in relevant fields. He pointed out that in the 'golden' month of October, at the invitation of Her Majesty The Queen, President Xi Jinping will pay a state visit to the UK. This will be the first state visit by the Chinese president in a decade. For China-UK relations in the new era, this visit is a significant event and joyous occasion that deserves grand celebration. It will mark a new milestone and herald a 'Golden Time' for China-UK relationship. He urged the two sides to join hands and redouble their efforts to make the state visit a success, to contribute to China-UK relations and to embrace the 'Golden Time'. 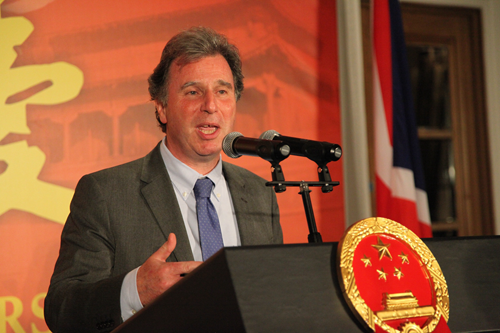 In his speech on behalf of the British Government, British Cabinet Minister Oliver Letwin extended warm congratulations on the 66th anniversary of the National Day of the People's Republic of China. 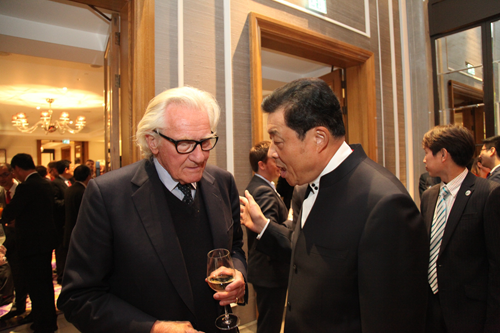 He expressed admiration for China's great achievements and projected a positive outlook for the development of China-UK relations. 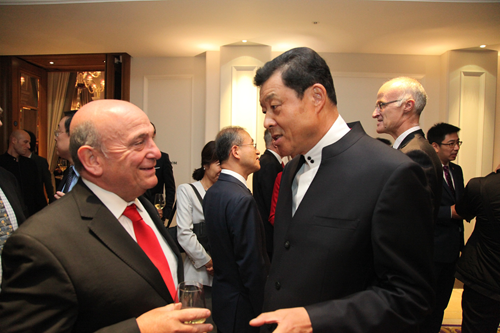 He noted that China has become a world power through reform and opening up in the past decades. China's booming economic development, in particular, has become an engine of the world's economic growth, and this has offered tremendous cooperation opportunities for the UK. The UK Government follows a positive policy towards China. Having visited China several times, it is his personal experience that UK-China relations are characterised by mutual benefit and shared profit instead of contest and competition. The development of the two countries offers opportunities to each other. Britain will continue to adopt an open policy towards China, Minister Letwin noted. Britain was the first western country to become a founding member of the Asia Infrastructure Investment Bank. 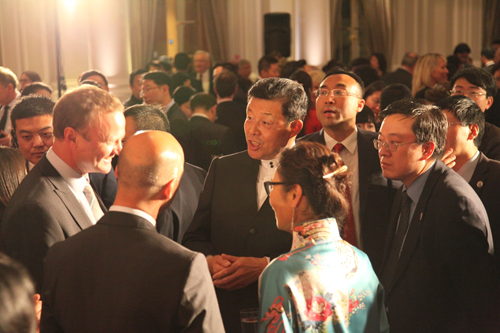 Britain and China have achieved fruitful results in their 7th Economic and Financial Dialogue. The Minister hoped that the two sides may complete the negotiations over the nuclear power project at an earlier date and he welcomed Huawei and other Chinese corporations to expand business in Britain. Britain is also willing to strengthen cultural and people-to-people exchanges with China, said Letwin. Improving mutual understanding between the two peoples will lay a solid foundation for stronger future cooperation. Letwin also mentioned the extensive shared interests of Britain and China in global and international affairs. The two sides should further strengthen communications and coordination. Britain warmly welcomes and is looking forward to President Xi Jinping's state visit. The Minister believed that the visit will elevate UK-China relations to a new height and start the 'golden decade' in the bilateral relations. The guests hailed the achievements of China's reform and opening up, believing that China will overcome difficulties and maintain vitality in its economic development, and echoing Ambassador Liu's remarks on the outlook for China-UK relations. They were eagerly looking forward to President Xi Jinping's state visit to Britain and expressed their willingness to continue to play an active role in their respective fields and promote greater development in the China-UK relations and cooperation in various fields in the 'Golden Time'. 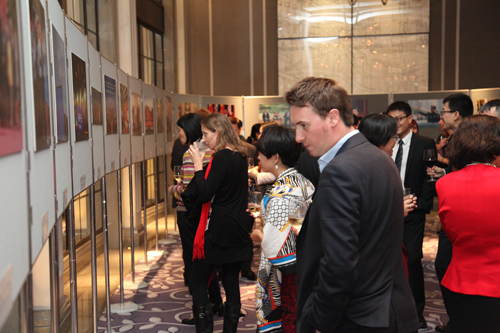 Guests viewed with great interest the photo exhibition on China's development and the exchanges and cooperation between China and Britain in various fields was on display at the reception and brought home with them copies of Xi Jinping: The Governance of China and other books and picture albums with themes of the Chinese Dream, 'One Belt, One Road' and the 70th anniversary of the victory of the Chinese People's War against Japanese Aggression and the World Anti-Fascist War. The reception was attended and reported by the People's Daily, Xinhua News Agency, CCTV and other Chinese language media, such as the Phoenix TV, Nouvelles d'Europe, Sing Tao Daily and Huashang Daily. 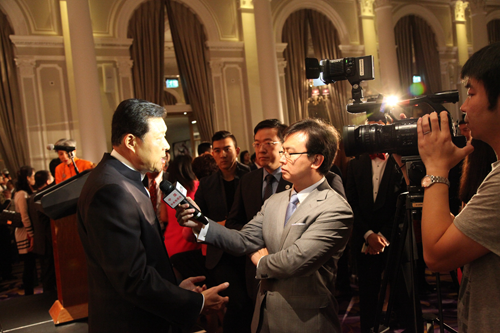 Ambassador Liu gave an interview to CCTV.